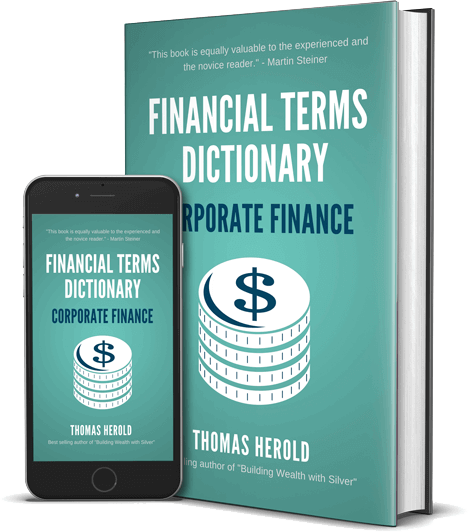 This practical financial dictionary for Corporate Finance terms helps you understand and comprehend most common Corporate Finance lingo. It was written with an emphasis to quickly grasp the context without using jargon. 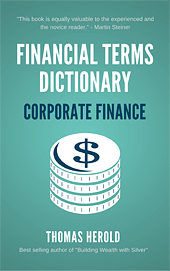 Each of the Corporate Finance terms is explained in detail and also gives practical examples. Example Term: What is a Financial Statement? Financial statements are official records of a business’ or personal financial activity. With businesses, financial statements present any and all pertinent financial activity as usable information. They do this in a clear, organized, and simple to comprehend way. Financial statements are commonly comprised of four different types of financial accounts that come with an analysis and discussion provided by the company’s management. The Balance sheet is the first of these. It is known by several other names, including statement of financial condition, or statement of financial position. The balance sheet details will outline a corporation’s ownership equity, liabilities, and assets on a particular date. This will give a good picture of the general strength and position of the company. Financial statements similarly include income statements. These can also be called Profit and Loss statements too. They outline numerous important pieces of company information, such as corporate expenses, income, and profits made in a certain time period. This statement explains all of the relevant financial details to the business’ operation. Sales and all associated expenses are included under this category. This section of the financial statement proves to be the nuts and bolts of the whole document. It provides a snap shot of the company’s ability to generate sales and turn profits. A statement of cash flow is also a part of a complete financial statement. As its name implies, this section will share all of the details regarding the company’s activities pertaining to cash flow. The most important ones that will be outlined include operating cash flow, financing, and investing endeavors. The last element of a financial statement includes the statement of retained earnings. This section of the document makes good on its name to detail any changes to a corporation’s actual retained earnings for the period that is being reported. These four sections of a financial statement are all combined together to make the consolidated financial statement, once they are combined with the analysis and discussion of management. With large multinational types of corporations, such financial statements are typically large and complicated, making them challenging to read and understand. To assist with readability, they may also come with a group of notes for the financial statement that also covers management’s analysis and discussion. Such notes will go through all items listed on the four parts of the financial statement in more thorough detail. For many companies, these notes for financial statements have come to be deemed a critical component of good and complete financial statements. Financial statements are used by several different groups of people who are looking at a company. Investors use them in order to determine if the company and its stocks or bonds make a sound investment with a chance of providing good returns on investments and profits in exchange for limited risks. Banks utilize these financial statements to decide if a company is a good credit risk for their loan dollars. Institutions and other groups that may be considering a cash infusion or buyout of the company use such financial statements to decide if the company is a viable investment or acquisition target. The fiscal year refers to an accounting period which governments or companies choose to use for their own accounting and in developing financial statements. Fiscal years are not necessarily the same as the calendar years. The U.S. government employs a different starting and finishing point for its own fiscal year. The IRS Internal Revenue Service permits companies to choose whether they will use calendar years or fiscal years in their tax computations. When individuals or companies discuss budgets, they often invoke fiscal years. They prove to be a useful reference point when contrasting corporate or government financial results over the medium to long term. The IRS has its own definition of fiscal year. To them these are comprised of 12 contiguous months that conclude on the final day in any month besides December. This means that where tax reports are concerned, a fiscal year could run February 1st to January 31st. American taxpayers also have the opportunity to utilize either 52 or 53 weeks long fiscal years instead of a 12 month one. In the case of the weeks’ version, the years will rotate back and forth between 52 and 53 weeks in length. Because the IRS automatically uses a calendar year system, those who employ fiscal years will need to adjust their own deadlines for turning in specific forms and getting in different payments. The biggest difference concerns the tax filing deadline. For the majority of American households and businesses, this will be no later than April 15th after the year in question for which they file. Those taxpayers working with the fiscal year system instead must file no later than the 15th day in the fourth month that comes after the conclusion of their fiscal period. This means that a business choosing to have fiscal years that span from May 1st to April 30th will need to turn in all tax returns no later than August 15th. The U.S. tax code makes it relatively easy for companies to use fiscal years in their income tax reporting efforts. All that they are required to do is to turn in on time their tax return which covers that particular fiscal period. The companies also have the right to opt back to using calendar years whenever it suits them. To make the change from fiscal back to calendar years, they need to obtain individual permission by asking the IRS. Otherwise, they will have to measure up to the criteria that they outline in their Form 1128 called the Application to Adopt, Change, or Retain a Tax Year. These fiscal years have a particular way of being addressed. Individuals who are discussing them reference them either by the end date or alternatively the end year. This means that one would refer to the American federal government fiscal year that starts on October 1st and ends on September 30th by saying the government fiscal year which ends on September 30th, 2016. If instead they were referencing spending by the government that happened in November of 2015, they would have to call this expenditure one that occurred in the 2016 fiscal year.